Billy Graham: Who is the Son of God? “The Bible teaches that God is actually three Persons. This is a mystery that we will never be able to understand. The Bible does not teach that there are three Gods—but that there is one God. This one God, however, is expressed in three Persons … God the Father, God the Son, and God the Holy Spirit. “The Second Person of this Trinity is God’s Son, Jesus Christ. He is co-equal with God the Father. He was not a Son of God but the Son of God. He is the Eternal Son of God—the Second Person of the Holy Trinity, God manifested in the flesh, the living Savior. “… He came to reveal God to men. He told us that God loves us and is interested in our lives. He told us of the mercy and long-suffering and grace of God. He promised life everlasting. “But more than that, Jesus Christ partook of flesh and blood in order that He might die. … The very purpose of Christ’s coming into the world was that He might offer up His life as a sacrifice for the sins of men. He came to die. To begin a relationship with Christ or to find out more, click here. 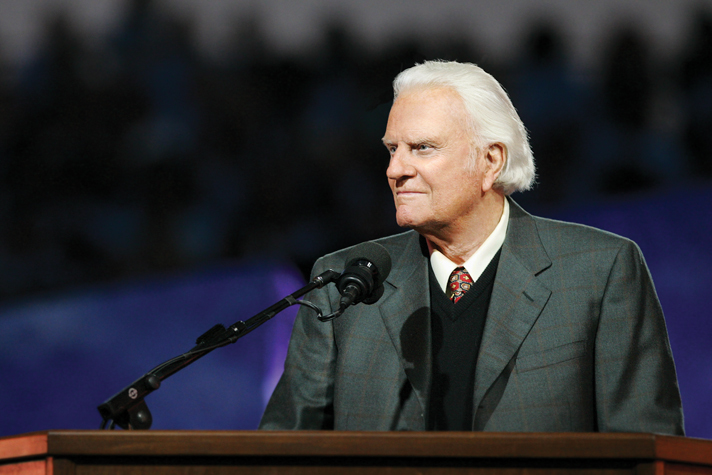 Billy Graham’s Daily Devotion: Whose Son is He? Billy Graham’s My Answer: What difference does it make? Billy Graham’s My Answer: I believe in God, but where does Jesus fit in? Read and Share on Social Media: Who is the Son of God?